Each year, the Iowa Cattlemen’s Association honors outstanding cattlemen and women through several different awards. In December, awards were presented to cattle producers from Garner, Centerville and DeWitt at the Iowa Cattle Industry Leadership Summit. *Editor's note: High resolution photos of the award winners can be downloaded from Flickr. The 2018 Outstanding Commercial Producer for the state of Iowa, Curtis Claeys, is a first-generation farmer. The Claeys farm is a pasture-to-plate operation that raises high-quality black Angus cattle for Iowa Premium Beef and Aurora. The operation near DeWitt includes row-crops, custom cropping, approximately 250 cows and a 650 head finishing operation. The Claeys farm has hosted an open house with the Coalition to Support Iowa’s Farmers and recently launched a locker beef program to sell beef directly to consumers. The multi-generational farm has transitioned over the years from swine production to dairy steer calves, then dairy heifer replacements before beginning beef production. On the farm, the environment is a top priority. Cows graze stalks on all highly erodible crop ground, allowing no-till and cover crop plantings. Claeys added a slatted confinement barn in 2014, and rotational grazing is also utilized in the pastures. The operation keeps detailed performance records, and uses those records to make decisions regarding culling and sire selection. In six years, the Claeys farm has achieved a 95 pound increase in yearling weight, while decreasing instances of calving difficulty to zero. Most of the bulls used in the operation come from the Iowa Cattlemen’s Association bull test. Curt Claeys has a strong record of leadership as a member of his county’s fair board, and continues that record on the Iowa State Fair Board. His son, Kendall, is a graduate of the Young Cattlemen’s Leadership Program and a board member for his county cattlemen’s association. The addition of another generation working on the farm full time has been a vital component in the beef enterprise. The 2018 Iowa Cattlemen’s Association Environmental Stewardship Award Program winner has always valued the land and the animals – both livestock and wildlife – who depend on it. Randy Eddy has been on the forefront of conservation measures his whole life. Randy and Denise continue to operate the Appanoose County farm Randy’s parents established 60 years ago, in 1958. The majority of the farm is used as hay or pasture ground for Randy’s cow/calf operation. Row-crop production is the principal use of land in Iowa, and Appanoose County is no exception. Approximately 21% of Iowa’s pastureland was converted to cropland from 2007 to 2012. During that same time frame, Randy converted between 250 and 300 acres of former row-crop land into pasture, which decreases nitrogen loss by approximately 85% and phosphorus loss by 59%. Fields susceptible to erosion were initially seeded down with alfalfa and slowly transitioned to pasture when the alfalfa stand thinned and Randy added other varieties of grasses and legumes. The Eddys’ land once contained sand strip mines, which left a wasteland in their wake. Randy and his father rehabilitated the former mines in the 2000s. With the hillsides stabilized, the Eddys used their cows to help improve the soil over the years. Rolling out hay bales strategically on the fragile land helped deposit cattle manure where needed, improving soil health while minimizing outside inputs. Over time, the Eddys were able to filling in the pits left by the mines and convert the landscape to pasture. Randy and his father also began planting switchgrass to diversify their pasture, provide wildlife habitat and improve soil health. As an active bow hunter, Randy was able to maximize the habitat and food available to native wildlife. The standing switchgrass and food plots on the farm bring pheasant, quail, deer, river otter, and wild turkey. Bald eagles can frequently be seen flying overhead. Milkweed flourishes in Randy’s switchgrass stands, providing valuable pollinator habitat. Randy also has three large, natural bee-hives on his property. In addition to haying and grazing the switchgrass, Randy and his father also harvested the seed and sold the stover to the state of Iowa to use in mulching roadside plantings. The decision to plant and utilize switchgrass would prove to have broader impacts far beyond Randy’s farm, however. In the mid-1990s, Randy took part in an innovative research project to lay the groundwork for commercial biomass energy production. The switchgrass on his land was used as a replacement for coal in a local electricity plant. After several years of research and shorter test burns, a three month test burn of switchgrass was completed in 2006 at the Ottumwa Generating Station in Chillicothe, Iowa. The test burn generated nearly 20 million kilowatt-hours of electricity from the renewable switchgrass fuel, a world record. The electricity generated would power nearly 2,000 average Iowa homes for an entire year. The experiment also reduced emissions of the primary greenhouse gas, carbon dioxide, by more than 50,000 tons. 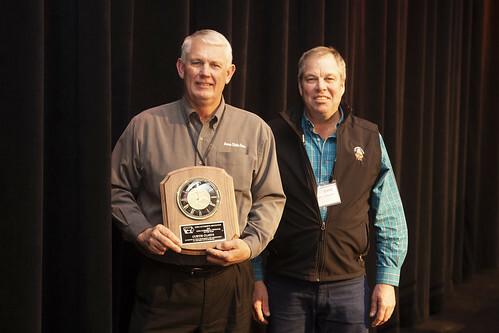 It is this dedication to the land, livestock and wildlife that led the Iowa Cattlemen’s Association Environmental Stewardship Award committee to select Randy and Denise Eddy as the 2018 winner. The Eddys’s niece, Lyndsay Harshman, an assistant professor and doctor at the University of Iowa hospitals, summed up the impact Randy and others like him have on not just Iowa’s cattle industry, but the well-being of the entire state. The 2018 Hall of Fame inductee, Ed Greiman, has a long list of accomplishments. From operating a cow/calf and feedlot operation with his family to leading national conversations on important cattle industry topics, Greiman has helped to shape the cattle industry. Throughout his career he has worked in various sectors of the industry, and held positions in some of the most influential organizations and companies in Iowa’s beef industry. His reputation for knowledge and leadership is recognized nationally. Greiman’s work over the years has an incredible impact on the cattle industry. From 1998 to 2002, he worked for the Iowa Cattlemen’s Association. While on staff, Greiman filled a variety of roles including Membership Field Director for Northeast Iowa, Beef Quality Assurance Director, and Membership Services Director. As Beef Quality Assurance Director for the State, he provided resources and oversight for Source and Age Verifying cattle and feedlots for value based market with all packers. He also developed an electronic ID and source-verified program with Cargill, in order to educate producers on the value of their cattle and allow them access to carcass data. After leaving ICA staff, Greiman served as the vice-president of Iowa Quality Beef Co-Op Packing Plant until 2005. As vice-president of the packing plant, he represented the interests of approximately 900 cattlemen who owned the Iowa Quality Beef packing plant and helped integrate fed cattle from Iowa into the McDonalds source verified program. At NCBA, Greiman has served as chairman of the Cattle Marketing and International Trade police committee, chairman of the working group on Price Discovery and chairman of the CME Cattle Futures Volatility and Contract Design Working Group. He has consistently advocated on behalf of Iowa’s independent feedlot operators in all of these roles. Greiman’s involvement in the Iowa Cattlemen’s Association and National Cattlemen’s Beef Association is commendable. He has served as the Northwest Iowa Regional Vice-President for ICA, as well as president-elect and president. During his time in ICA leadership, he chaired the Iowa State Beef Checkoff Exploratory Group, which ultimately led to the successful referendum vote to reinstate the state checkoff in 2016. He also worked with a variety of partners to help develop the Iowa DNR Workplan Agreement for feedlots. Greiman continues to take part in ICA’s feedlot council, NCBA working groups, and serves on Iowa State University’s Animal Science Department Advisory Board. He is also the manager of Upper Iowa Beef. About the Iowa Cattlemen's Association: The Iowa Cattlemen’s Association represents nearly 10,000 beef-producing families and associated companies dedicated to the future of Iowa’s beef industry. ICA’s mission is “Grow Iowa’s beef business through advocacy, leadership and education."